Napans tend more than grapevines. The area's diverse soil and mild climate make possible a generous yield of agricultural products. 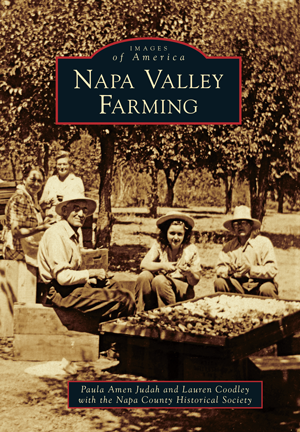 This book traces the cultivation of these products through a chronology of Napa's farming history, from indigenous food plants to the orchards that were planted to feed gold miners—orchards that would soon function as both therapy and sustenance for the patients in the newly created asylum. European and Asian immigrants joined newly emancipated slaves and Mexican citizens who had settled here before the Treaty of Guadalupe Hidalgo. Together they cultivated the land, picked the fruit, nuts, and hops, cut the wheat, kept bees, and tended livestock on dairy farms and cattle ranches. Each chapter begins with a poem inspired by farming or a recipe reflecting the valley's bounty. The scents of peaches, apples, cherries, pears, prunes, and honey linger in the imaginations of thousands of locals, while the trees, hives, and vines continue to thrive wherever placed. Paula Amen Judah and Lauren Coodley have combined their mutual backgrounds in poetry and history to produce three published works: Napa: The Transformation of an American Town (2007); California: A Multicultural Documentary History (2008); and If Not to History: Recovering the Stories of Women in Napa (2009).